If you need a display showcase to present your customers with your most prized merchandise, then the 48" Full Vision Display Showcase will do the trick. 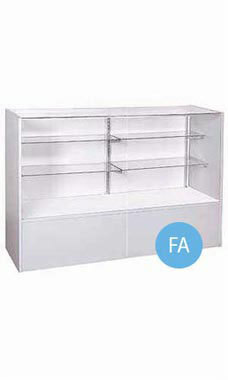 This classic display case will give you years of affordable elegance and dependability. Featuring a gray finish, the showcase is designed to match almost any fixture in your retail store, especially our corresponding gray display units. Constructed with a low pressure melamine laminate finish and a tempered glass top and front, the full vision case will give your customers a full view of the merchandise they are purchasing. Additional features include two rows of adjustable 1/4" split glass shelves 8" and 10" depth, steel interior standards and shelf brackets. This allows you to create the most beautiful displays for your most prized inventory. Crating for secure shipping is included in the price of the case. Optional lock and light kits sold separately. Overall size measures 38"H x 18"D x 48" L. Fully assembled and available for immediate shipping.